So, as you may have noticed in the photos I posted from the weekend, Schonbrunn is a humongous palace. I believe it was built to rival Versailles, commissioned by Empress Maria Theresia herself supposedly. By the way she had something crazy like 16 children, 12 of whom lived to adulthood. One of which was Marie Antoinette, ironically. In any case, there are some ruins at the top of the hill behind the Gloriette that are from an Allied bombing in February of 1945. They are kind of tucked away, but then if you walk through the woods a bit on your way down, to the left if you are looking at the palace, you will also find a memorial plaque (auf Deutsch). And while the statues and the gardens are incredible, my favorite stops thus far at Schloss Schonbrunn are the Tiergarten (zoo) and the beautiful, antique greenhouse. The zoo has been awarded Best in Europe, and they do have quite an extensive collection. The polar bear exhibit is currently under construction so we didn't get to see them, but the best show this visit was the Tirolean Garten (again near the top of that treacherous hill) where a tiny spotted goat kid could be found. But keep in mind they have most everything else, including some funny South American bears that like to lounge around in hammocks, and a funny Giant Panda who sits like Buddha stuffing his face with bamboo. The African elephants are always one of my top picks, and on my last trip here, the ring tailed lemurs were a huge crowd pleaser because the babies were clinging to the mothers' backs while they walked around. We did see a snake this time, one not in an exhibit. He was black with a light underside, and he was well over a meter long (see I'm practically European already!). There were several people clustered around, very excited, and at one point they flagged down the zookeeper who was in the red coati habitat nearby. PS- so Jon had his first Wienerwurstel experience here at Schonbrunn, where he ordered the hot dog mit Frankfurter, pictured below. 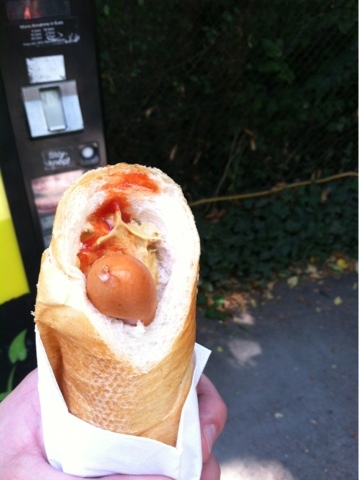 Please don't mistake this for a dirty photo, it really is a sausage in bread!